BUFFALO, N.Y. -- The University at Buffalo women's basketball team (2-1, 0-0 MAC) will stay on the road for a pair of games this weekend in Las Vegas as they participate in the South Point Thanksgiving Shootout for the first time in program history. The Bulls will open up the trip with a showdown against Georgetown on Friday, November 23 at 8:00 pm before closing out the trip with a game against South Dakota State on Saturday, November 24 at 8:00 pm. • The University at Buffalo women's basketball team will head to Las Vegas for a pair of non-conference contests against Georgetown and South Dakota State in the South Point Thanksgiving Shootout. • Buffalo put up a good fight but their effort fell short on Sunday afternoon as the #3 Oregon Ducks handed the Bulls their first loss of the season, 102-82. The 82 points scored against the Ducks were the most they allowed this season. • Senior guard Cierra Dillard saw the honors continue to roll in this week as she was named MAC East Player of the Week after her 32-point outburst against #3 Oregon. Dillard was also placed on the Wade Trophy watch list, marking the first UB player in school history to earn a spot on the prestigious list that named the top 35 players in the NCAA. Earlier this season she earned a spot on the Naismith Award watch list. • Dating back to last season, Cierra Dillard has scored 20+ points in seven straight games and is averaging 27.6 points, 5.0 assists, 4.6 rebounds and 3.0 steals across that stretch. • As a team, the Buffalo offense has produced five 80+ point scoring efforts across their last eight games dating back to last season. 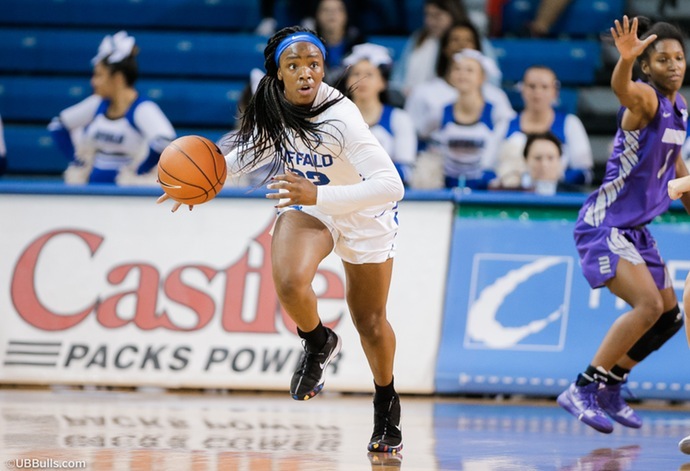 • The University at Buffalo women's basketball team hit the road for their toughest road test of the season on Sunday afternoon as they tangled with #3 Oregon. The Bulls hung tight early on but were defeated 102-82 at Matthew Knight Arena in front of 5,205 people. • The Bulls were led offensively by senior guard Cierra Dillard who recorded a season-high and game-high 32 points, five assists and four rebounds while connecting on 10-for-24 from the floor. • Fellow senior Courtney Wilkins had her best game of the season on Sunday night as she netted 19 points while going 6-for-13 from the floor and 5-for-11 from behind the arc. • Off the bench, freshman Keowa Walters had the best game of her Buffalo career against the nationally ranked Oregon Ducks as she finished with a career-high 16 points and seven rebounds across 25 minutes of work while going 7-for-10 from the floor. • As a team, the Bulls were able to force 19 Oregon turnovers and they turned those chances into 25 points. The Bulls forced All-American Sabrina Ionescu to turned the ball over a season-high seven times in the loss. •The difference in the game was the charity stripe as the #3 Ducks were able to convert on 34-of-38 freebies while the Bulls finished the game going 17-for-20 overall. • The Georgetown Hoyas enter Friday's game against the Bulls with a 4-1 record on the year as they are coming off of a 70-41 victory on Monday night against the Pittsburgh Panthers. • The Hoyas also downed Richmond, Maryland Eastern Shore and Loyola this season and their only loss came on the road at James Madison, 69-57. • Georgetown is being led offensively by Dionna White who is averaging 14.0 points, 8.0 rebounds and 2.4 assists across an average of 32.8 minutes/game while Mikayla Venson is averaging 14.0 points, a team-high 4.4 assists and 3.4 rebounds while connecting on 43.8% of her three-point shots. • Defensively, the Hoyas are holding their opponents to 49.6 points/game and just 28.4% shooting from the floor and 27.7% from behind the arc. The Hoyas are also forcing an average of 14.2 turnovers/game. • Offensively, Georgetown is averaging 63.8 points/game while shooting 37.4% from the floor and 34.7% from behind the arc. • The South Dakota State Jackrabbits enter the South Point Thansgiving Shootout this weekend with a 3-1 record. The Jackrabbits have won three straight games including last time out against Creighton, 74-48. • The Jackrabbits will open up their South Point Thanksgiving Shootout on Friday afternoon as they take on Baylor. • South Dakota State is being led offensively by Macy Miller who ia averaging 19.5 points, 6.3 rebounds, 2.0 assists and 2.0 steals while connecting on a team-high 53.6% from the floor and 93.3% from behind the arc. • Myah Selland is enjoying a strong start to her season as she is averaging 10.0 points, 4.8 rebounds and a team-high 3.5 assists while starting all four games. • As a team, South Dakota State is averaging 71.5 points/game while outrebounding their opponents 40.5 to 28.8 through four games. • Senior shooting guard Cierra Dillard was tabbed as MAC East Player of the Week for the first time this season on Tuesday afternoon after posting 28.5 points, 5.0 rebounds, 4.0 assists and 2.5 steals across a pair of games for the Bulls. • On Tuesday morning, Dillard was one of 35 players to earn a spot on the Wade Trophy watch list. This marked the first time in school history that a Buffalo player earned a spot on the list. • Last week, Dillard was named to the Citizen Naismith Trophy Watch List as she is one of 50 players on the list and the only mid-major player to earn a spot on the prestigious list. She is also the lone UB women's basketball player to earn a spot on the list in school history. • Senior Cierra Dillard is in her final season in a Buffalo uniform and the ultra-talented guard has accumulated 1,429 career points across her stops with UMass and the Bulls. She finished off her first season in a UB jersey leading the squad with 566 points which ranked fourth in school history for points in a single season. • So far this season, Dillard has been nothing short of great for the Bulls as she has produced three straight 20+ point efforts including a 30+ point effort last time out against #3 Oregon. • Dillard has produced seven straight 20+ point games for the Bulls and is averaging 27.6 points across that stretch. • The senior captain has led the Bulls in scoring in all three games this season and for the year she is averaging 26.7 points, 4.7 rebounds, 4.0 assists and 2.5 steals while connecting on 45.1% of her shots and 79.4% of her free throws. • Last time out, Dillard outproduced preseason All-American Sabrina Ionescu as she posted a game-high 32 points, five assists and four rebounds against the #3 team in the country. • Across her career, Dillard has produced at least one steal in 36 of 38 games and recorded multiple steals in 29 games. She also set a career-high with seven thefts in a win over Toledo (1/20/18) last season. • The crafty passer has recorded at least one assist in each of her 38 career games while recording 5+ helpers 22 times a season ago. She also led the team in assists 16 times during her UB career. • Dillard has led the Bulls in scoring 22 times since joining the program while going over the 20-point plateau a team-high 14 times. The Bulls owned a 11-3 record when Dillard scores 20+ points. • Senior sharpshooter Courtney Wilkins will be relied on heavily this season to step up and score the ball on a more consistent basis and she definitely has embraced that role through three games this season. • Earning her third straight start, Wilkins was a difference maker for the Bulls on Sunday night against #3 Oregon as she netted a season-high 19 points while connecting on a season-best 5-of-11 three-pointers across 30 minutes. • Freshman forward Keowa Walters is going to be relied on heavily in the post this season for the Bulls and the strong creative post looks like she will be up to the task. • In Sunday's game against #3 Oregon, Walters came off the bench and made a huge impact as she netted a career-high 16 points and seven rebounds while going 7-for-10 from the floor overall. Walters made her presence felt across 25 minutes of work. • On the season, the freshman is averaging 10.3 minutes, 7.3 points and 4.3 rebounds as she is one of three UB freshman to appear in all three games. • Onwuka is enjoying a strong start to her junior season as she is averaging 7.0 points, 2.3 steals and 1.7 rebounds while shooting 72.7% from the floor. She has also started all three games so far this season for the Bulls. • Last time out against #3 Oregon, Onwuka played 21 minutes and finished with three points, three steals, two assists and two rebounds. • Hall returns for her second year with the Bulls and looks poised to take over the starting duties after earning the start in each of the Bulls' three games this season. • The Hamilton, ON native is averaging 25.0 minutes, 4.0 points, a team-high 4.3 assists, 2.0 rebounds and 1.0 steals per game so far this season while starting three games at the point for UB. • Last time out, Hall had an impressive showing at the point as the Bulls took on #3 Oregon. The sophomore finished the game with five points and a career-high seven assists across 36 minutes of work. • The Buffalo defense has been great early on this season in causing turnovers from their opponents as they are forcing an average of 23.6 turnovers/game across three games. • As a team, Buffalo leads the MAC and ranks 33rd in the NCAA forcing turnovers so far this season. • The Bulls are also averaging 10.3 steals/game so far this season while netting an average of 22.0 points/game off of opponents turnovers. • Last time out, UB was able to force 19 turnovers by the Oregon Ducks and they turned those chances into 25 points in the loss. The UB defense forced preseason All-American Sabrina Ionescu to commit a season-high seven turnovers in the loss. • Last time out, the Buffalo offense posted their second straight 80+ point effort in the loss at #3 Oregon. The Bulls posted 82 points against the Ducks, the most scored against the nationally ranked opponent this season. • The Bulls are tough to beat when they scored 80+ points as they own a 16-3 record dating back to last season when doing so.